There’s something about winter that just makes me so unmotivated to stay active. I mean seriously, who can turn down pjs, a warm blanket and hot chocolate? Yeah, it’s just a little bit of everything about winter that leaves me entirely unmotivated. Now that we’re a family unit though, I find myself wanting to break out of that rut, for the health of our family and to start implementing some healthy habits in my son, G.
That sounded nice didn’t it? Let’s be honest…who can really stay cooped up with a cranky toddler because he is getting cabin fever??? So, after doing some research, I’ve come to the realization that staying active during the winter is not nearly as hard as I was making it out to be. 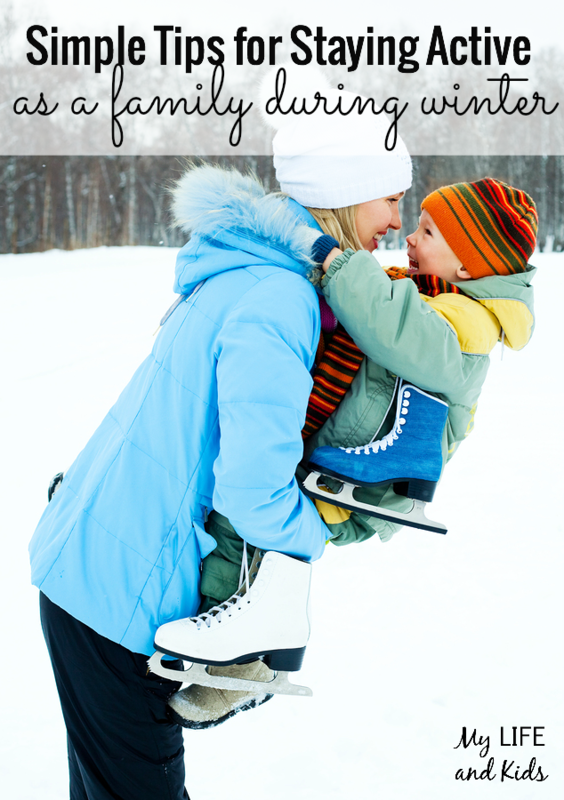 Here are five simple tips on how to stay active in the winter as a family. Before you and your family do anything, you need to embrace winter. If you hate winter, most likely your kids do too. There needs to be an attitude shift before you can really get out there and stay active as a family. This might be the hardest at first to implement, but staying active just isn’t that hard – especially when you see tip #2! You can stay active by simply playing as a family. Make snow angels (burns 214 calories/hour on average), have a snowball fight (burns 319 calories/hour), or go ice skating as a family (burns 450 calories/hour). Check out these 50+ outdoor and indoor activities to try as a family. 3. Try something new as a family. So you’ve all probably been sledding together. You can certainly still hit the favorites, but why not try something new? Like a winter scavenger hunt for example! 4. Weave exercise into what you’re already doing. You can simply encourage and implement exercise into your family’s daily activities! Doing last minute holiday shopping at the mall with your kids for example? Challenge them to take the stairs and count the stairs, making it into a fun game. After spending all that time being a rock-star active family, enjoy some time with those pjs, warm blankets and hot chocolate. A family movie night was always my favorite way to end a perfect active day with my family when I was little.